Do you need new ideas to increase efficiency, sales and profitability? We know you do! With nearly 400 exhibitors, Farwest is your ticket to the nursery and retail garden center industry. Whether you’re a grower, retailer, wholesale buyer, supplier, or landscape professional, you’ll find that Farwest offers you the complete trade show experience. You can pack a lot into 4 days at the Farwest Show. Trends. Insights. Ideas. New plants. State-of-the-art products. All this in one convenient, hard-to-beat in August location: Portland, Oregon. This popular show feature showcases a wide variety of new plants that are sure to inspire. Find the hottest new industry products to advance your business. See the latest trends in the industry displayed creatively in a garden-like setting. 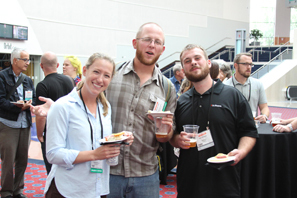 At Farwest, you’ll experience more than you’ve come to expect from a green industry show. Make sure you’re in your seat this year for Dr. Charlie Hall, Chief Economist for American Hort, who will be presenting ‘need to know’ updates on the economic performance across the green industry to date in 2019 and will discuss how to position your business for the next economic downturn. If you’re a business owner in the green industry, you won’t want to miss this session! Meet me out West to discover horticultural gold.